An in-depth look at a ripe marriage, 45 Years asks questions about secrets by omissions, and tests the resiliency of a long-term union. The film enjoys two exceptional performances from Charlotte Rampling and Tom Courtenay, but has relatively thin material to play with. Retiree couple Kate and Geoff Mercer (Rampling and Courtenay) live quietly in the English countryside and are approaching their 45th wedding anniversary. He is starting to mentally slow down, while she remains healthy and alert. Their life is rocked to its foundation when a letter arrives to inform Geoff that the body of his lover from 45 years ago, a woman named Katya, has been discovered beneath a melting glacier in Switzerland, where she died while on a hiking vacation with Geoff. He is devastated by the reawakened memories, and now reveals to Kate the depth of his love and infatuation with Katya, how they considered themselves effectively married, and that he fully intended to spend the rest of his life with Katya had she stayed alive. Suddenly feeling very much second best, Kate is forced to reassess her marriage and the last 45 years of her life, as the anniversary party fast approaches. 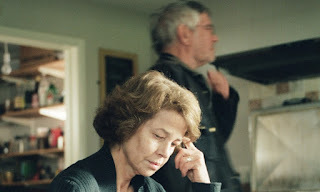 Written and directed by Andrew Haigh, 45 Years is a two-person psychological study, with Kate engaged in most of the thinking and Geoff almost happily surrendering to memories. As the thick layer of accumulated years cracks and doubts creeps in, the film unfolds in silent intensity. Consistent with the English middle class propensity to be more reserved than animated, when Kate is abruptly forced to re-examine her marriage, the outcome is not measured in histrionics, but rather in questions pondered but not posed, and answers concluded without being spoken. With Kate in full reflective mode, Haigh makes clever use of mirrors and screens to emphasize her forced re-examination of a life that once seemed straightforward. Kate cannot help but catch glimpses of herself in mirrors, and she starts to frequently see Geoff indirectly through his reflection. In one of the film's highlights, Kate delves into her husband's past through an old-fashioned slide show and an ad-hoc screen, the old images seen from behind while the camera stares at Kate absorbing, for the first time, a pivotal love in her husband's life. Contemplation does win the battle with conversation, and 45 Years encounters a problem. The film only runs for the 95 minutes, and plenty of screen time is invested in observing Kate emotionally struggle in silence. Charlotte Rampling carries the weight and projects the internal conflict between a piercing sense of betrayal and the plain facts of a life well lived, but she alone cannot inject enough heart into the film. The pace slows to a crawl, as there is only so much drama that can be squeezed out of abstract events from 45 years prior. When on-screen happenings and on-screen interactions are both most prominent by their absence, forward momentum almost completely stalls. 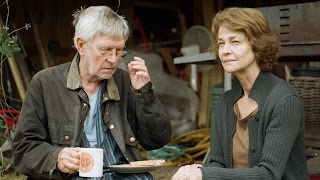 Despite the narrative scarcity, 45 Years is a worthwhile introspective exploration of marital foundations unexpectedly shifting, late in the cycle of life.